Big, huge and giant thanks to Egg to the Apples for this recipe. It is awesome and delicious.This was my first experience eating or baking zucchini bars, and I thought they were crazy delicious. As encouraged, I let these chill in the fridge before serving, and I thought it made them taste so much better (but they were already good). 1. Preheat oven to 350° F. Cream butter, sugar, eggs, and vanilla. 3. Add zucchini and chocolate chips. 4. Grease a 9×13 inch pan and pour the batter in. Bake for 35-40 minutes. Yum! We love zucchini and chocolate chip cookies!! I can't wait to try these! Great idea! Combining chocolate and zucchini! This will be on my to do list for tomorrow. Thanks! These look so yummy! I have some zucchini in my garden ready to use! Can't wait to try these! Hmmm... 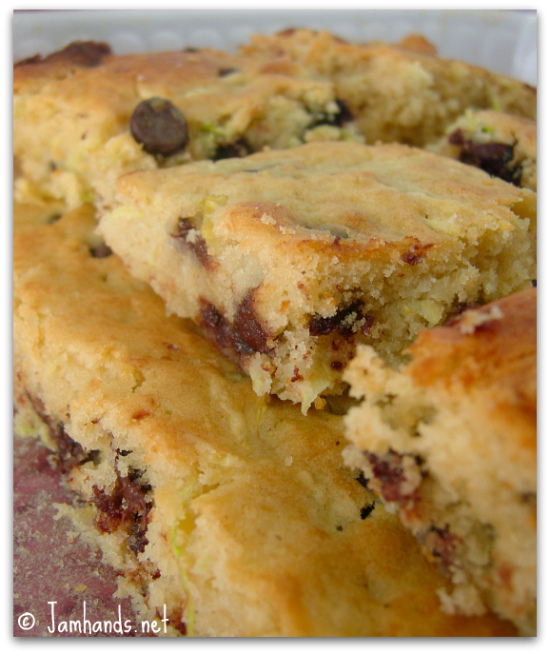 I've made zucchini bars ~ never with chocolate chips though. I will definitely have to try these! Oh my God this looks so good and i`m sure that it is delicious too. I think that this is a easy recipe so i will give it a try, thanks a lot for sharing. What a great way to use zucchini while sneaking nutrition into your kids! So trying this! Got some shredded zucchini in the freezer now ... thanks! okay i'm gonna send you my address! lol i'll take two dozen! yummy! thanks for partying with me! Oh my goodness, I saw these on Sweets for a Saturday and another good way to use zucchini. Making this right now! I have an abundance of zucchini coming from the garden right now...and a family picnic tomorrow that this will be welcomed at! :) Thanks for linking up. Yum! Looks like the perfect way to sneak some veggies in on my kids. Delicious! Thanks for sharing on Sweet Indulgences Sunday. What a great recipe to try with all the garden zucchini. This looks delicious! Thank you so much for sharing with Full Plate Thursday and hope to see you again real soon. Hope you are having a great week! Yup, I've gotta try these! Yum! Perfect way to use up some of this zucchini! I love zuchinin and I would have never thought of this combination! I'd love it of you'd share this with WorkShop Wednesday. It woud make a great addition to the party! Just tried these, exactly according to the recipe, and they are the BEST chocolate chip bar cookies I've ever had! Thanks so much! Joy - So glad to hear you enjoyed them!